We’ve had a little war brewing in my neighborhood. I don’t live in the middle of the city. In fact, it’s a dead end road in a snug mountain nook. So there aren’t many restaurants compared to other parts of the Seoul Metro area. But it’s still a microcosm of a method of business practiced in Korea that I still can’t understand. I’ve mentioned before that queues are like velcro. Small businesses are that way too. Galbi restaurants tend to group together in packs, as do cell phone stores, as do camera shops. My ‘hood has maybe around ten restaurants, which is small for Korea. So you’d think that if one type of restaurant opened another would open to fill another niche. A couple of years ago, we got our first pizza place. A short time later, another pizza place opened. They both went out of business. A cheap galbi place opened right next to another cheap galbi place. For my four years in this neighborhood, we only had one bakery, Paris Baguette. And that could barely be supported by our neighborhood. But that didn’t stop a Tous Les Jours bakery from opening down the street. Soon after TLJ opened, we saw that our old Paris Baguette shuttered up and left. I looked, and a new Paris Baguette was being set up right next to TLJ. But that’s not the funny part. I see this happen all the time. 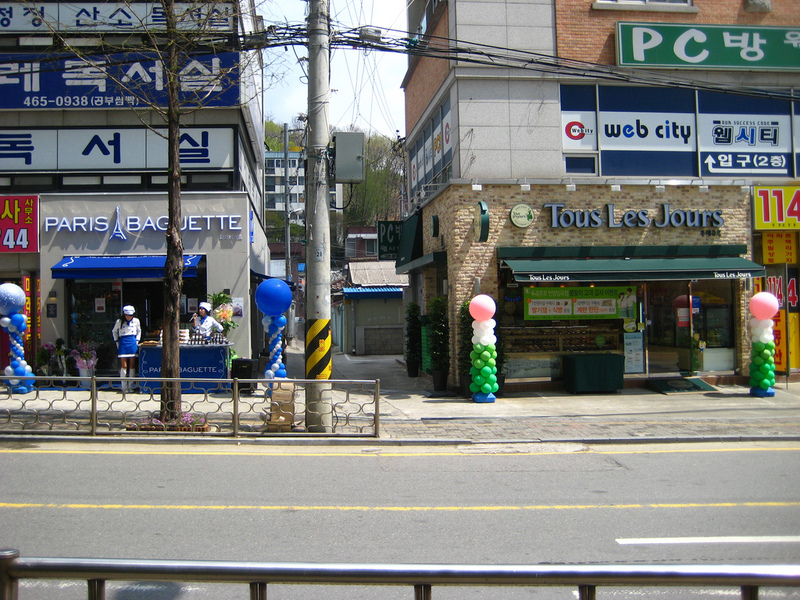 When Korean businesses open, they place balloons out front, blare music, and have people chat away on microphones. Sometimes they have clowns or dancing “doumi” girls. Eun Jeong had noticed on her way to work that Paris Baguette was having their “Grand Open” with balloons and sales girls. When she returned from work, TLJ just couldn’t stand it. They went out and got balloons for their store too. It’s like children with lemonade stands, folks. Chuncheon has the famous dakkalbi district in downtown, too. There are some cities in America that do the same thing. Think of NYC’s garment district or diamond district. They all congregate in the same area. Please, no more bakeries in Korea! They are like a virus taking over from good local Korean restaurants. I don’t need seven bakeries within 10min walk of my house in Jamsil. Two is enough. Market forces being what they are a lot of the time in Korea dueling businesses can sustain themselves, but the old maxim applies: location, location, location. In Bucheon in the last month a Hollys opened up across the road from an Abide cafe, Abide promptly shut for a month to renovate, ad then a Yogapresso – next to Abide that had been laying dorment since I arrived in Bucheon suddenly sprang back in to life. Three coffee shops literally 10 metres apart! And in the last week all three have been packed to the gunwhales.